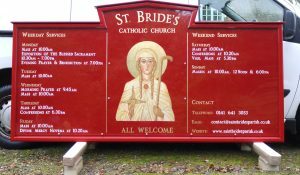 I finished this Bespoke Exterior Church sign just before Christmas. All the construction elements of the sign are hand crafted and all decorative embellishment of the sign done purely by hand. This is now in situ at the Church and the Vicar was very happy with the finished sign. For more pictures visit my Ecclesiastical page on my website.